Corrosion-free and contamination-free handling of acids, caustics and ultra-pure liquids with zero emissions in a compact size. Vanton Chem-Gard® CGMC magnetically driven end suction process pumps are sealless, single stage, close-coupled centrifugal pumps. All fluid contact parts are injection molded of solid, stand-alone polypropylene (PP) or polyvinylidene fluoride (PVDF). CGMC pumps eliminate corrosion associated with metal pumps, wicking and contamination associated with fiberglass pumps, and porosity/delamination associated with lined metal pumps. With no mechanical seals to leak or emit vapors, these sealless pumps offer zero emission performance, making them the environmentally safe choice for transferring acidic, caustic, volatile, and otherwise hazardous fluids. High performance permanent rare earth magnets transmit power, with the inner magnet rotor assembly encapsulated in thick-walled PP or PVDF. 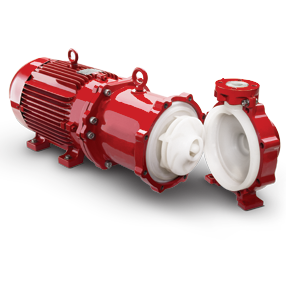 A non-metallic containment can assembly reduces losses in pump efficiency by eliminating troublesome eddy currents. Rugged thermoplastic wet end components are encased by structural metal armor allowing CGMC pumps to withstand the same nozzle loadings as metal pumps. Equipped with NEMA or metric C-face motors, the close-coupled CGMC design eliminates the cost and concern associated with pump/motor alignment, while reducing overall length by approximately 20 percent compared to conventionally mounted pumps, allowing placement in restricted spaces. The CGMC hydraulic head conforms to ANSI B73.1 process pump dimensional standards, allowing drop-in replacements without pip.